I love baking. Cookies are one of the easiest baked goods to prepare. And with the holidays in full force it is high time that you got into that kitchen of yours and preheated that oven and got to making some Holiday Cookies! At my house growing up we always had the tradition of having family members over and all of the kids would gather around the kitchen and decorate sugar cookies with lots of colored sugars and jimmies and all sort of other pretty decorations. They usually looked like a mess afterwards and I don’t know if we ever ate all of them. But the act of it was festive enough for me! I’ve pulled some fun holiday cookie recipes for ya’ll to try out this month! Shortbread cookies – are by far my favorite cookies to make any time of the year, but this version makes it just a little bit more festive – probably even more so if you used colored sugars! I love this holiday take on a cookie classic. I remember I used to get the original kind in the cookie aisle – but come to think of it I haven’t seen them in awhile – I wonder if they are still around? Either way, this cute ‘Shirley Temple’ is fun! 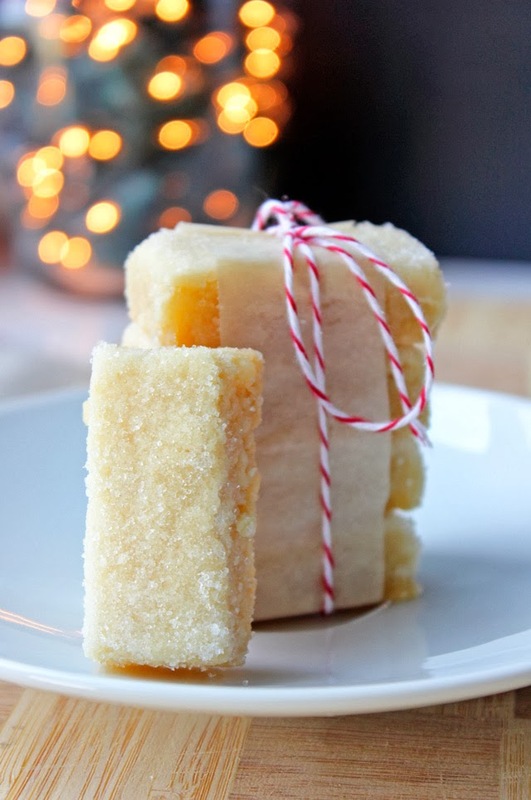 The holidays wouldn’t be complete without lots of excessive alcohol added into every sweet dish possible! 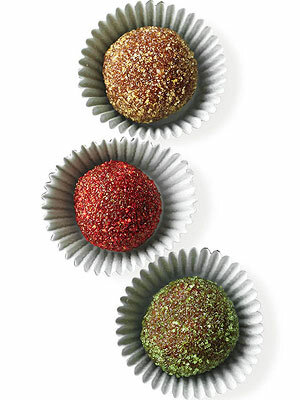 These bourbon balls are doing it right by adding the colored sprinkles onto this potent cookie. Now these I love for multiple reasons, I love myself some beets – in any form, and I love how the beets naturally turn these cookies into a fun holiday hue. I’m not sure I’ve ever had the original Rugelach myself but according to my findings these are very much a holiday favorite! Well whichever path you take this holiday season. Get to making something sweet and tasty for all of your loved ones – and of course pop a few of the right out of the oven ones for yourself! This entry was posted in Food and tagged cookies, food, holiday on December 24, 2013 by Jem. With just a few days left until Christmas, I’m sure most of you already have your home decorated with lots of festive fun decor. When I imagine decorations for this time of year, I always think of my Grandmother’s house when I was growing up. I spent every Christmas Eve and Christmas morning there for years and years, and she had the same decorations every year. My Grandmother’s decor was likely all purchased around 1955, because it was just like all of this lovely atomic Christmas gear I’ve featured today! She had it all- the colorful glass ornaments, elf figurines with little doll faces, and that ceramic tree! She had a red tree topper exactly like this one. I definitely remember lots of reindeer decor. It seems the reindeer have been put on the back-burner in more recent years, but in the atomic age they were everywhere! I just love vintage Christmas decor! It’s so cheerful and sweet, and it reminds me of my childhood. Most of my Grandmother’s beautiful collection has disappeared or broken, but I plan on creating my own collection with the help of Etsy and vintage shops. This entry was posted in Etsy Roundup, Inspiration and tagged atomic, christmas, vintage on December 20, 2013 by Nicki. Sometimes I just love getting lost in 60s inspiration tumblrs / blogs / pinterest. This post is a dedication to all things 60s! This entry was posted in Inspiration and tagged 60s, inspiration on December 19, 2013 by Jem. It’s Christmas time, and in my opinion, the best time for movies and television! Like it or not, Christmas-themed programming just has a certain longevity that makes it enjoyable and totally charming for young and old, no matter how many times you’ve watched it. I’ve comprised a list of some of my favorite Christmas viewing goodies, many of which must be watched every single year or it just doesn’t feel like Christmas to me. 1. A Charlie Brown Christmas (1965). There’s just no denying that this masterpiece of animation is most people’s favorite. It’s a classic story of the kid that no one ever seems to like who finds someone less fortunate (a sad tree) and gives them a chance at fulfilling their destiny. The voices, the songs, the dancing… you just can’t go wrong with this heartwarming gem. 2. Rudolph the Red-Nosed Reindeer (1964). This clay-mation special was my favorite when I was little. I had a Rudolph toy whose nose lit up as it walked across the room, and I would always play with it while watching. The story is quite a lesson in tolerance, especially for parents. Donner was such a jerk to his son! That is, until he realized that Rudolph’s freak “problem” actually made him very important and essential in saving Christmas. The Abominable Snow Monster is my favorite character. All he needed was a dentist-in-training to fix his toothache and he turned into a giant googly-eyed teddy bear! 3. National Lampoon’s Christmas Vacation (1989). Hands down the funniest Christmas movie of all time, Chevy Chase’s wacky holiday romp will always have a special place in my heart. My dad was, undeniably, the Clark Griswold of the south. He did it all- covered his house in millions of tiny lightbulbs, stapled himself to the side of the house, fell from the roof (and broke his pinky toe), never yielding in his insatiable need to celebrate Christmas in the BIGGEST way possible. One of my favorite things about this movie is that it shows just how incredibly wrong everything can go during the holidays, and that it’s ok to be ok with it. Sometimes the turkey just comes out mummified. 4. Love Actually (2003). Every boyfriend’s least favorite, this mash-up of every English actor you can think of gets me every time! Hugh Grant’s rendition of “Good King Wenceslas”, Bill Nighy’s horrendous christmas cover of “Love is all Around”, Rowan Atkinson painfully gift-wrapping a gift that Alan Rickman should not be buying- it’s a laugh riot! It’s also incredibly heart-warming- the kid gets the girl, a man professes his love for his best friend’s wife without any expectations, and the widower finds his Claudia Schiffer. I also like that not every storyline has a happy ending. Laura Linney gives up on the dreamy office guy for a greater responsibility, and Emma Watson basically just stops her husband from doing anything to completely ruin their marriage, but not without some serious damage. I could do without Santana’s “Smooth” segueing Colin into Wisconsin, but the Beach Boys’ “God Only Knows” makes up for it in the end. Not to mention this movie solidifies Mariah Carey’s “All I want for Christmas is you” into eternal holiday life, as if it needed any help. 5. Saturday Night Live (1975-present). Anything SNL has ever done having to do with Christmas is included here. Since the beginning, the jokesters down at Studio 8H have been lampooning the holiday season in style. No matter what anyone thinks about any given cast over the years, there’s no denying that when it comes to Christmas, SNL always delivers. Adam Sandler’s “Hanukkah Song” and Jimmy Fallon’s “I Wish it was Christmas Today” have become holiday classics, and Alec Baldwin will forever be know for his “Schweddy Balls”. These are just a few of my favorite things to watch at Christmas. What are some of your faves? I’d love to hear about them! This entry was posted in Editorial and tagged christmas, movies, tv on December 18, 2013 by Nicki. Our 2nd Photo shoot for Seven Minutes and Heaven was this past weekend – and it was a lot of fun, and a lot of work. We are still in the process of editing all of the amazing photographic results that came from it – but here is a sneak peak for those of us who can’t wait! This entry was posted in Editorial, Fashion, Shop and tagged holiday, photoshoot, shop on December 17, 2013 by Jem. The Pizza Underground – 60s Pizza-Themed Revival of The Velvet Underground. It was during the early 2000s when I first became obsessed with The Velvet Underground. Amidst working a full-time job, my first year in college, my first time living on my own, and having my own car – I would drive around aimlessly (back before gas prices became too steep) pop their ever famous recording with Nico cassette in my car tape deck and bliss out to the drug-fueled tunes of this mid 60s band. I feel like this is a common story when people recall their first time getting into The Velvet Underground it usually stems around some sort of ‘glory days’ or excellent times in people’s lives. The band was created by Lou Read and John Cale right here on the dirty streets of NYC and they also had the fortune of being managed by one of my biggest artistic influences Andy Warhol, which I’m sure was nothing short of inspiring in the way of having free creative musical rein. As the band went through many different band-mate configurations throughout the late 60s and early 70s it is the early two recordings that stay most in people’s brains when thinking about The Velvet Underground. With Lou Reed’s death this October has brought upon many tributes to the late singer. And with that sad event has come something lovely that originated once again on the now cleaner streets of NYC. Currently they are just a medley band and do not have any full tracks – which anyone who is a fan of The Velvet Underground may be a little disappointed with – considering the droning on of the longer tracks on their albums is always a treat to get lost upon. The band was originally formed in February 2012 obviously as just a joke/laugh by musicians Phoebe Kreutz, Matt Colbourn, and Deenah Vollmer. The band may have a little celebrity upper hand with Macaulay Culkin joining the band this November and pulling together the above recording. Not only have they created some fun music to hopefully let the younger generation segue into learning about the original band – they also have some fun imagery being created in their honor. Personally I am in love with this combination and want to urge all my fellow New Yorkers to head over to their free show in Williamsburg TODAY at Baby’s All Right @ 7pm! Free Pizza While Supplies Last! This entry was posted in Music, New York and tagged 1960s, cover band, lou reed, music, pizza, the pizza underground, the velvet underground on December 13, 2013 by Jem. finally, Finally, FINALLY! Today, my husband and I are packing up everything we own and hauling off to the big apple! We’ve been waiting AGES for this and we couldn’t be more excited! Now, both creative forces behind SMiH will be based in NYC, the fashion capitol of the world. I’m very excited to join Jem in the big city so we can make this little vintage business in to something amazing! We’ve already got a photo-shoot in the works for this weekend, so stay tuned! This entry was posted in New York and tagged adventure, moving, new york on December 12, 2013 by Nicki. Partying in the 60s the Canadian Way! I found this beautifully illustrated miniature paper cookbook on etsy a couple of weeks ago and knew I had to review it for our blog over here. It was written by a Canadian brewing company and has some very fun and creative ideas of how to entertain using different kinds of beer as the center piece. Getting creative with beer has never seemed so elegant thanks to this cookbook. It’s chock full of recipes usually centered around different kinds of parties you can have, I will be going through them each week till the end, so you can have some party inspiration to last you all year long! The first installment is getting the basics down! The first couple of pages inside the book give you the low-down on pulling together a party and giving you a little insight into the Canadian way! p.s. if you are having trouble seeing the images at this size – simply click not the image and it will bring you to the larger size! The introductory page lets you in on the ultra hip modern Canadian lifestyle and how they like to party almost any time of the year. Complete guest list early so you know how many to plan for. Write your plan on paper! Plan Menu one week before, and don’t make anything you haven’t prepared before. Do Party shopping far enough ahead. Prepare as much food ahead as possible. Position beverage bar away from area where food is served. Use one large dramatic decor instead of multiple small ones. As the hostess you are responsible for keeping the party moving! Serve ale and lager in attractive beer glasses, the Stein is more suitable for outdoors or game room parties where everyone is on the move. Beer should be served at a temperature from 42 to 45 degrees, normally you will find this temperature on the bottom shelf of your refrigerator. For smoother, more enjoyable beer it should be poured with a proper head. Hold the glass upright and allow the beer to splash down the centre of the glass. If the head builds up too rapidly, decrease the flow. If the head is not growing fast enough, hold the bottle perpendicularly over the glass and allow the remainder to splash down and froth around. Beer glasses should never be washed with soap since the fat from soap leaves invisible traces on the glass which will cut down the beer head. After washing in hot water with detergent, the beer glass should be rinsed in cold water and turned upside down to drain. Some connoisseurs even insist on finishing glasses in a hot water and salt solution, then in clear water – then drain dry without wiping. Now that you are all prepped and ready to get down to Party Planning, here are a couple of beer related pieces to get you on your way to hosting the most fabulous party! Can’t go wrong with some classic 60s amber beer glasses. A lovely bakelite bottle opener for all opening all of your beer bottles with class and dignity! And finally this lovely pewter stein ice canteen, would look lovely as a piece for your barware set. Well that’s all for now folks! Until my next installment – have fun party prepping! This entry was posted in Food, Hosting, Parties, Products and tagged 1960s, 60s, beer, Canadian, hosting, parties, Party Planning, Party tips, vintage on December 11, 2013 by Jem. Ok, I know I am wayyy late on this, but I just binge-watched Mad Men seasons 1-5 on Netflix, and it is AMAZING! After years of not having cable television or membership to streaming services, I have finally jumped on the Mad Men bandwagon. My biggest surprise? There has been a television show seemingly created just for me and I have been missing it! For like, 6 years! As much as I am totally wrapped up in the story of the 60s advertising giants and their exploits, I just can’t get over the overall design of this show. The costumers, set designers, and writers have done such an amazing job of recreating the look, feel, and attitude of the 1960s. They even make a point to show all the women smoking while pregnant like it’s no biggie. You can actually witness the (quite accurate) evolution of style from season to season. Since I was a little child, I have been obsessed with all things 60s. I watched nothing but Nick-at-Nite growing up (when it actually ran shows from the 50s and 60s, not the late 90s). I always wanted to emulate the style and sophistication I saw on the screen. I ferociously teased my hair to get that bump on the crown of my head, wondering why it would constantly fall flat. I later realized that not only was my hair quite fine, but no amount of hairspray and teasing could do what a good old fashioned hair-piece could do. My Grandmother’s house was almost completely decorated with mid-century furniture and decor, right down to the Christmas decorations! Watching Mad Men not only feeds my fashion and drama desires, it makes me feel like a kid again (even though I wasn’t born until the early 80s). Honestly, my favorite part of the show is the set design. I want Don & Megan Draper’s super mod Manhattan apartment! Even the office was upgraded when they switched agencies. They went from slightly subdued late 50′s straight lines and muted colors to super pop colors and Eames chairs. Betty’s insufferable distaste in children! I just can’t get enough of these effortlessly stylish, endlessly troubled characters and all of their 60s shenanigans. I know I’m not alone! This entry was posted in Fashion, Inspiration, New York and tagged 1960s, mad men, mod, new york, television, vintage on December 10, 2013 by Nicki. In honor of “Winter Storm Cleon” freezing out a large portion of the U.S. this week, I thought it would be fitting to spotlight something that keeps us warm and cozy… adorable vintage coffee pots and tea kettles! What’s better than cuddling up with a hot cup of coffee or tea on a cold day? Not much, in my opinion! All of these vintage pots are so adorable! I obviously love the style of kitchens from the 60s and 70s. They paid so much attention to detail. Check out that groovy bird one! These beautiful pieces are so bright and fun, perfect for cheering you up on a chilly day. I have a weakness for anything with that “atomic age” style from the late 50′s and early 60s. The starburst patterns, the gold leafing, I just can’t get enough! All of these pots are perfect for get togethers or just enjoying a cup on your own. It’s never too late to ditch that boring individual-pod coffee machine! Or just neglect it until that morning you’re super late for work- hey, modern conveniences have their merit, too. How cute is that lemon one? If that doesn’t cure your winter blues, I don’t know what will! This entry was posted in Etsy Roundup and tagged 1960s, 1970s, atomic, coffee pot, Etsy roundup, tea kettle, vintage on December 6, 2013 by Nicki.